Kudumbashree provides skill development training to women, motivating them to take up micro enterprises for livelihood. More than 31,000 enterprises are set up in the state by individuals and groups. It is a pleasure to note that women groups have exhibited courage to take up innovative enterprises in multiple sectors. Click on the district pages to note the Top 10 innovative enterprises set up in the district by Kudumbashree women. The following table gives an overall picture of Kudumbashree’s Micro enterprises in each district, sector wise. 1 Plastic Shredding Unit 26 2017 Recycling of plastics to usable materials. 2 Green bytes 6 2017 Providing cut fruits and vegitables to needy. 3 ABCD Management unit 10 2017 Started for the purpose of controlling stray dogs. 4 Women Kalaripayat training unit 5 2015 Providing training for women in martial arts. 5 Creche 5 2014 Started in Technopark for Nursing infants and toddlers IT professionals. 6 Kudumbashree Travels 7 2013 7 women drivers are running cabs around the district. 7 Kudumbashree Construction units 30 2016 Kudumbashree women construction unites undertake various construction projects from across the district. 8 Mushroom Cultivation unit 25 2016 25 women entrepreneurs started 5 mushroom cultivation unit with the support of district panchayath subsidy. 9 Paper carry bag unit 50 2016 50 women entrepreneurs started 5 Paper carry bag unit with the support of district panchayath subsidy and training. 11 Koothambalam 20 2016 Started Koothambalam training with the support of district panchayath susidy for promoting traditional art forms. 13 Bio Resource centre 5 2017 Outlet which sell seeds, seedlings, bio fertilizers and pesticides. 4 Amal Driving school 1 2015 Provide training to Kudumbashree women, supporting kudumbashree taxi service project. 5 Quail Farming 4 2016 Making profit on sales of quail egg. 1 Railway parking 28 2016 Railway vehicle parking under the supervision of kudumbashree district mission running successfully.Now this project implimented in Alappuzha,Cherthala,Chenganur,Mavelikara,Harippad,Thuravur.At kayamkulam and Ambalapuzha starting within one week. 2 Five star vanitha canteen 6 2017 This firm started at District court,Alappuzha under NULM Project. 1 Kurinji Power Laundry Unit 12 2016 Kurinji Power Laundry unit is started in the year 2016 in Munnar Grama Panchayath. It is a convergaenvc project by Kudumbashree and Grama Panchayath. Munnar is a tourist area and because of that many resorts and hotels are established there. Washing and Ironing facility is too less and kudumbashree found an opportunity there. 4 Upasana Rain Coat making unit 5 2016 In Ayyappankoil CDS a rain coat making unit started in the year 2016 by 5 NHG Memeber. In seson time they will get more than Rs.5000.They marketed their products in nearby shops. 7 Deva Clinical Lab 5 2010 5 NHG members from pallivasal gramapanchayth started this unit in the year 2010. It functioned very well and evey member got a monthly turnover of 10000. 6 Nirmaliyam Soap Unit 3 2013 Nirmalyam Soap Making Unit Producing Variety Of Products Like Toilet Cleaner, Floor Cleaner, Soap, Dish Wash etc. 12 Painsree Satellite Unit 5 2011 Pineshree Food Processing Unit Producing Jam, Squash , Coconut Chips, Banana Chips, Pickle Etc. 1 Vanitha Help Desk, Varavoor 5 2016 First among the State. Provide assistance to public who seeks various help from Panchayath. Provide DTP work, Tea and Snacks,Online registration, Application writing etc. The project came under Yuvashree scheme of Kudumbashree. 2 Kudumbashree Matrimony, Porkulam 5 2016 It is a service oriented innovation of District Mission. The unit took loan from Union Bank of India, Kunnamkulam of Rs. 3,00,000 without subsidy. The unit is charging Rs. 750 from boys whom are seeking marriage and charging Rs. 5,000 as commission after engagement. No registration fees and commission amount are collecting from girls. The application forms are seriously scrutinizing using the three tier system of Kudumbashree and LSGI representatives. 3 Manjal Vanam, Pudukkad Constituency 350 2017 It is aimed to produce 10 lakh Prathibha Seed Turmeric with the help of JLG. 1 NANMA Solid waste Management Unit 10 2012 Solid waste Management Unit Started in Alathur. They Convert the solid waste into Bio Fertilisers and Sell it. They Run a Plastic Shredding Unit also. 2 Srishti Handicrafts 6 2013 They Purchase Bamboo from Bamboo Corporation and convert them into Different type of Utility Handicrafts. 3 SUJALAM 26 (5 Groups) 2017 They Install Well recharge systems for individual Houses. Already Undertaken Work to Recharge 1000 Wells. 1 Misty Fresh Drinking Water Unit 2015 5 They are 5 members working in the Unit. Its started for pure water. 2 Edayur Chilly 2017 3 More production in less area, crop cultivated within 4-6 months.it has more demand in the Market. 1 Theertham Drinking Water 5 Five members of Kudumbashree in Kozhikode Corporation North CDS started a drinking water project named “Theertham” in Kozhikode Corporation. The project aims to supply safe drinking water at low cost. These ME group supply the safe drinking water in Calicut Corporation area, 1 rupee per1 Litter. 2 Feminera Women Hostel 2014 The district mission Kozhikode started a new women hostel in Gujarathi Street Kozhikode. The hostel was started in 2014 named as Feminera Women hostel. The hostel run under the management of Kudumbashree training enter prises “Eksat”. In this hostels have the facilities of dormitory, single and double Bedrooms, food, Dining hall and reading room. There are 56 women staying in the hostel. 3 Zoya Choclates & Cake unit West Hill 2016 Zoya Cakes and Choclate enterprises started at Kozhikode in 2016. Eight members of Kudumbashree included in this project. The various type of chocolates like the flavor of nuts, Badam,white chocolate, dark chocolate,milk chocolates are producing in the unit. Around 50000/- rupees earn as the sales turn over in a month. Mrs. Sulekha is the secretary of these enterprises. Booking No: 04954040229. 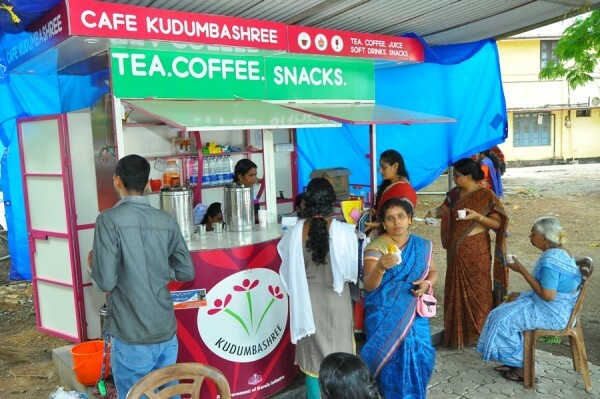 4 Mobile Cafe Kudumbashree district mission Kozhikode started a mobile café in Calicut City. 3 members of Kudumbashree running these enterprises. Through this project the unit earn Rs.12000 to 15000 as the sales turn over in daily.The main aim of the project is to serve the homely food to the public. 5 Sparsham Foot wear Upper stitching Marad Kudumbashree district mission Kozhikode implemented a project named as “sparsham” for the victims of Marad Communal riots. The programme was implemented associated with the famous foot wear company VKC. The unit produces the upper part of the VKC chappals. There are 18 kudumbashree members working in the unit. 6 Navabharath Cloth Bag unit Kadalundi During the time of Tsunami natural calamity, Kudumbashree district mission implement various livelihood programs for costal community. As the part of this programme 4 womens of kudumbashree members started a cloth bag making unit. Now these enterprises got more acceptability among the society due to the defects of plastic use. 7 Nirmalyam Gold Cheruvannur 5 2011 Five members of Kudumbashree NHG in Cheruvannur Nallalam started a different type of project named as Nirmalyam Gold in 2011. The Product of this eneterprises are bangles,rings,long chain in 1 gram gold. 8 Udhayam Printers Unnikulam 9 Udhayam printing unit is the one of the prestigious enterprises in Kozhikode district. The units have started at the early stage of micro enterprises formation. Now the unit members undertaking printing work of printing works of various govt institution and private firms. 9 kudumbashree members included in the unit. 9 Meta Ladies health Fitness Center 2015 In the context of increasing the life style diseases, a group of kudumbashree in Kozhikode corporation tried for a solution to prevent the such diseases. As part of this enquiry , they decided to form a Micro Enterprises group under Kudumbashree and started the unit in 2015. Many women utilize this facility.The unit also provided Yoga and Aerobics training for ladies. 10 Gramashree Organic Manure, Maruthonkara 8 2013 In 2013 a group of Kudumbashree Members started an Organic manure unit named as Gramshree. 8 members of Kudumbashree included in the unit. Organic Manure and coir pits are the main products of the unit. 1 Keerthi Napkin unit 5 2016 manufacturing eco friendily napins.There is no chemical used they used only pine wood pulp to make napkin. 2 Mahathma Handicraft unit 5 2014 manufacturing babana fibre handicrafts like bag,floor mat etc. 6 Panchavarna Bag unit 5 2015 They produce mural paint bag ,purse,chappals and ornamants. 1 CDS RESOURCE COMPLEX 15-20 2017 Convergence project of District, grama panchayaths and Kudumbashree mission. Selcting one CDS for pilot study. A complex consists of CDS office, Helpdesk for providing information regarding panchayth, Kudumbashree and other governemnt projects, selling various forms in less price, A marketing center for selling Kudumbashree products, A skill training center and library also. Estimated project cost of 60 lakhs. 2 BLOSSOM T SHIRT AND SPORTSWEAR 5 2012 The one and only Jercy and Tshirt stiching Kudumbashre Unit in Kerala. 5 KUDUMBASHREE TRAINING CENTER 10 2017 A convergence project. Starting a residential training center and Kudumbashree group is responsible for functioning of the unit.